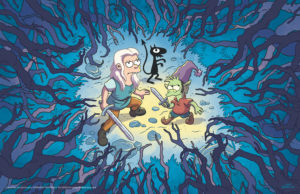 REVIEW: Disenchantment – A Delight or a Disappointment? 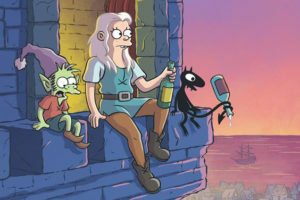 Disenchantment, Matt Groening’s latest original animated series for Netflix, brings the past into the proverbial trilogy of past, present (The Simpsons), and future (Futurama). The familiar mix of production team and voice over artists gives the viewer a sense that they’re watching something not unlike what they have seen before. The recycled humor, sight gags, and animation style are also fairly redundant for those familiar with Groening’s other work. The show itself carries a great deal of potential; however, it falls flat overall. The main character, Princess Bean (Abbi Jacobson), is a troublemaking wild woman with a mind of her own and a take charge attitude. Constantly disobeying her father, King Zog (John Dimaggio), she drinks and parties hard, accompanied by her cursed demon friend and bad influence Luci (Eric Andre) and recently liberated from his all-too-happy elven home Elfo (Nat Faxon). One wonders if The Simpsons’ ‘Happy Little Elves’ may have served as an inspiration behind the Elfo character. Though he starts out as an obnoxiously happy elf, his desire for Princess Bean reeks of a desperation the likes of the Pretty in Pink‘s Duckie. 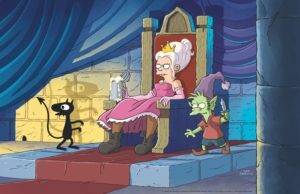 The supporting cast boasts an array of talent, including Tress MacNeille, Maurice LaMarche, and Billy West, all of whom are well known for playing roles in The Simpsons and Futurama. The stand out supporting character has to be Prince Merkimer, voiced by the inimitable Matt Berry of The IT Crowd (among other British comedy series). While these versatile voice actors are a welcome presence, they don’t quite add enough to the show to keep the viewers’ interest for very long. Unfortunately, the story is disjointed and doesn’t really pick up until the middle of the season. Beginning with a plot to marry off Princess Bean and ending with the resurrection of Bean’s long-dead mother, Queen Dagmar (Sharon Horgan), who had been turned to stone, the series is messy and all over the place in terms of narrative. There are a few interesting subplots and adventures for Bean and company, one of the most memorable of which is Bean’s castle party and Viking rampage while King Zog is out of town. All things considered, the typical teenage misadventures of the plucky protagonist come off as cliché and overused tropes. The season finale is a confusing ball of tangled storylines and ends with an anticlimactic twist. Without spoiling anything, suffice it to say that the payoff is sadly missing in spite of the dramatic buildup. Truly, it’s hard not to judge Disenchantment against the rubric of The Simpsons and Futurama when they are so well-known and well-loved. Those shows set the bar quite high and Disenchantment fails to measure up. The show itself is visually stimulating, but the lack of a unique and interesting storyline makes the show a difficult watch. Although it’s good to see Groening working on something new, one wonders if perhaps this blast from the past is too soon for its time.